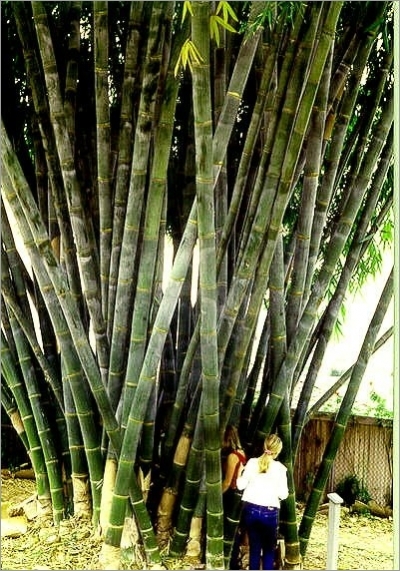 Dendrocalamus giganteus, the Giant Bamboo, is native of Asia. This is one of the most massive of all bamboos; it can reach an impressive 30 meters high and 30 cm wide in optimal conditions. Bamboos are ideal to use as wind breaks and privacy screens. They can be trimmed to the desired height and be cultivated in pot. The Giant bamboo can grow up to a meter high every day. The cylindrical trunk has colours going from bluish grey to yellowish brown. It has dark rings. The diameter of each pole is the same from top to bottom. The top half of the pole will bear branches. The leaves of the Giant bamboo are slim and measure from 15 to 45 cm long. The leaves are bright green and stay all year long. Bamboos grow in a dense mass. This is because Dendrocalamus giganteus’s rhizomes grow very closely together.